It's the little things people do that will make the difference. As a child, Wangari Maathai learned from her grandmother that a large fig tree near her family home in central Kenya was sacred and not to be disturbed. And she remembered gathering water at the springs protected by the roots of the trees. Then later when she returned to her family home, she began to notice the changes in the environment: the drying watersheds, forest clearance, increased desertification and the disappearance of the streams of her childhood . She listened to the women in the village talking about the ecological changes and came 'to understand the linkage between environmental degradation and the felt needs of the communities'. She saw that trees were the key to replenishing the soil, providing fuel, protecting the watersheds and providing nutrition. Wangari Maathai - internationally recognized for her persistent struggle for democracy, human rights and environmental conservation. The goal of the Nobel Peace Prize is to award people who "have done the most or the best work for fraternity between nations, for the abolition or reduction of standing armies and for the holding and promotion of peace congresses." and on schools and church compounds. "The award wasn't only a call for the environment to be at the centre of work for peace; it was also an acknowledgement for the African people in general, for the struggles they face every day. It was a demonstration of how important the environment and natural resources are in making sure we survive; and it was a message of hope. It was also saying to African women, in particular, that women can make an impact, although their ideas and actions are often dismissed. In addition, it was a recognition of the many citizens around the world who had been working on a set of similar issues – the environment, human rights, democracy, women's rights, and peace-building – and had not perhaps seen the connections between them. I was honoured to be the recipient." In recognition of her deep commitment to the environment, the United Nations Secretary-General named Professor Maathai a UN Messenger of Peace in December 2009, with a focus on the environment and climate change. 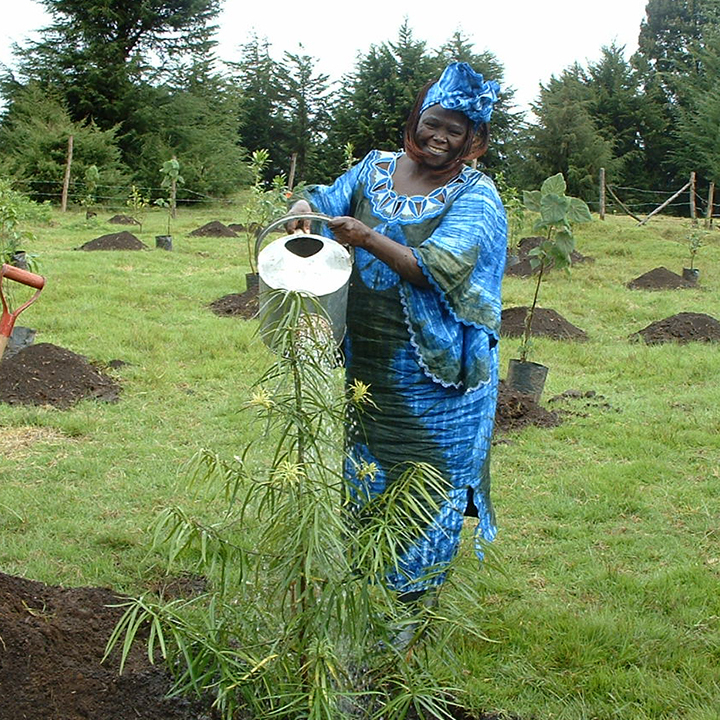 Wangari Maathai died on 25 September 2011. The Green Belt Movement continues to flourish and the UNEP Billion Tree Campaign, inspired by her work, and now run by Plant for the Planet, grows in ambition and success.